Together with our daughter Kathryn and her family we live and work at Toll Farm, our beef and arable farm, and are on hand to answer questions and help you enjoy your stay with us. Sheep or cattle are often in the field behind Dairy Cottage while ducks and moorhens live on the fenced off pond in front of the Cowshed, all of which help you to feel you are in the heart of the countryside. 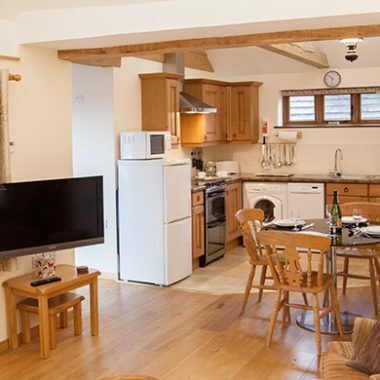 Both cottages have many exposed oak beams, an open plan kitchen/dining/lounge area with controllable under floor heating and large wet floor shower rooms. There is level, easy access in and around both cottages with no ramps or steps. Parking is directly outside both cottages and we have a 4* rating by Visit England. The area is rich in wildlife and heritage, and is an ideal base for visiting the South Downs National Park, many National Trust properties, the coastal towns of Hastings, Eastbourne and Brighton, Drusillas Zoo Park, Herstmonceux Castle and Science Centre or “Go Ape” tree top walk at Bedgebury Pinetum. In additiion fishing and golf and the historic towns of Battle, Lewes, Pevensey and Rye are close by. There is always something to do for all ages whatever the weather. No pets are allowed and therefore our cottages are suitable for guests with allergies. 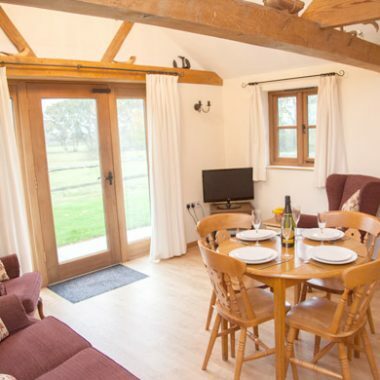 Dairy Cottage and the Cowshed are only 60 metres apart and can be booked together for larger groups. Extra seating for meals can be made available in the Cowshed.